Jean Bugatti (15 January 1909 – 11 August 1939) was a French automotive designer and test engineer. Born Gianoberto Maria Carlo Bugatti in Cologne, he was the eldest son of Ettore Bugatti. At 30 years old, Jean was killed while test driving the Type 57 tank-bodied racer. He crashed into a tree while trying to avoid a drunk cyclist who snuck onto the track. blueangels1015 Uploaded by blueangels1015 on Jun 10, 2018 . Jean Bugatti And Roadster 1932 - Desktop Nexus Cars Download free wallpapers and background images: Jean Bugatti And Roadster 1932. Desktop Nexus Cars background ID 2387719. Jean Bugatti (15 January 1909 – 11 August 1939) was a French automotive designer and test engineer. 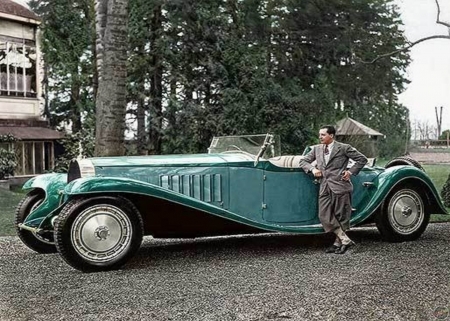 Born Gianoberto Maria Carlo Bugatti in Cologne, he was the eldest son of Ettore Bugatti. The Bugatti is an Italian car manufacturer, known mainly for its sports cars as well as those of the pre-war period. Founded in 1909 by the Italian emigrant Ettore Bugatti, it ceased its activities in 1963. Since 1998, Bugatti is a trademark of the German group Volkswagen Aktiengesellschaft, which has created ad hoc a financial company called Bugatti Automobiles.